Twelve Days of Christmas: the Lone Star version, Part III. As a silvery solstice moon reflects across the shimmering waters of a languid west Texas river, a pair of tundra swans (Cygnus columbianus) eerily shimmer as they glide along, “a-swimming” through their winter refuge as they have done for possibly decades previous. The graceful couple began their avian marriage in their third year of life: bonding to one another in a glorious “victory display,” bowing heads and lanky necks while saturating the shallow brackish and freshwater havens comprising their spring migrations northward with a harmonious duet of melodious bugles. Their union fortified, the two returned to their natal grounds amidst summer-flushed tundra ponds and lakes, which stretch across northerly arctic climes, and set about the task of locating and defending a suitable territory. Another cycle of autumnal and spring migrations separated the bonded birds from their first attempt at nesting in this newly acquired breeding ground. In the years to come, the ivory beacons of elegance persevere through early freezes, delayed springs, and the predations of egg- and nestling-craving wolves, jaegers, foxes, and gulls to generate the next wave of whistling-winged waterbirds. The male swan staunchly guards his brooding mate as she tends to a solitary nest of four to six creamy white eggs. Newly hatched signets are ushered to the safety of bountiful pond margins and fatten on aquatic worms, mollusks, insects, stems, seeds, and roots, all under the vigilant watch of two aggressively protective parents. 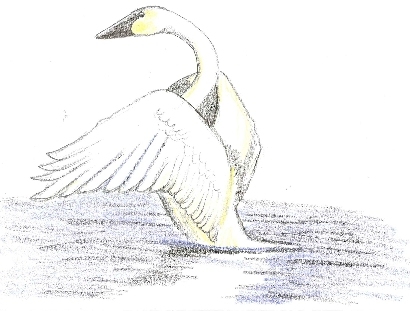 As freshly molted swan feathers dance across the breezes that whisper through July and August, the primary-lacking adults are grounded and pass the days and nights afloat, surrounded by their quickly maturing offspring and perhaps envisaging the sheltered tidal inlets and sluggish rivers that will chart their journeys southward. In mere weeks, the magnificent pair, freshly feathered, will sprint across the glinting waters, hoisting their 20 lb bodies into the cooling Arctic air, and lead the youth of the year to their winter haunts, where they will placidly “a-swim” as a family. This verse conjures up blissful images of pastoral scenes populated with lacey-bonneted and ruffly-skirted young ladies merrily filling tin buckets with creamy pools of dairy delight as black-and-white-blotched bovines placidly chew away at their alfalfa-seasoned cud. Perhaps these dream-like visages of peaceful symbiosis between dainty women and their dairy cow companions still unravel in some distant, organically-tended rolling meadows buried in the countryside of a cooler-climated state, but the residents of Texas are fortunate enough to have the miniaturized versions of these farming customs at their front doorstep. The players may not be as aesthetically pleasing on first impression, but their adaptive efficiency and co-dependence is even more fascinating than that of their mammalian counterparts. Free of the unnecessary accoutrements of frilly dress, the female workers of multiple species of ants across the Lone Star state are master milking maids…of aphids! Infamous as destroyers of household plants and vegetable gardens, aphids are tiny insects that proffer sustenance by tapping into vegetation and leisurely relying on the plant’s vascular system to pump its store of raw sugars through the vampirous bug’s digestive system. Out the other end emerges aphid poop oozing with excess sugars and wittingly referred to as “honeydew.” The energy-supplying, fecally-distributed sugars are avidly sought after by ant farmers, who gently stroke the bloated abdomens of their aphid stock to stimulate the release of the sweetened, gooey droplets. Some aphid species have become so dependent on their milking hymenopteran maids that they no longer possess the ability to defecate on their own. Without the devoted attendance of their antennaed ant keepers, the constipated aphids would perish. Aphid-milking ants tend to their insect herds as any human dairy farmer would oversee his/her fruitful bovines. Honeydew-harvesters stand guard over their cattle, going as far as destroying the eggs of aphid predators, such as ladybugs and other carnivorous beetles, when the opportunity arises. 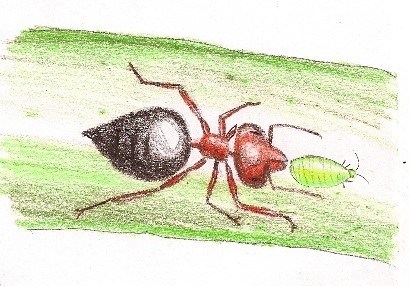 As plant life withers under the pressure of gorging aphid colonies, ant maids gingerly pluck the sucking insects from their vegetative attachments and transport them to more fertile feeding grounds. When the chill of autumn escalates, some sugar-milkers will ensure the health of their aphid flock by transporting freshly-laid aphid eggs to their own winding tunnels. In subterranean safety, the aphid germ are expertly stored in an environment with optimal temperature and humidity levels, emerging within the protection and climate-controlled nursery of the hymenopteran nest. Once the warm breath of spring creeps through the ant colony, the freshly hatched aphid stock is ushered to host plants above ground to begin honeydew production once again. As with every seemingly mutualistic biological system, one half of the equation may attempt to sway favor to their own side to reap disproportionate rewards. On occasion, ant dairymaids resort to physical and/or chemical manipulation of their stock rivaling BGH-wielding factory farmers of the human world. Over the span of evolutionary time, aphids have developed the ability to sprout wings amidst the stress of dense populations and/or dwindling food sources. Flight appendages free the normally grounded insects, permitting their mass exodus to the greener pastures of far off lands. Wings also carry them away from their sugar-craving caretakers. Desperate to retain their honeydew-producers, ant workers resort to ripping newly forming limbs of flight from their aphid herd. Going one step farther, some ant species manufacture specialized hormones to completely impede wing development and hamper the physical mobility of the aphids under their supervision, preventing escape of their herd through aerial and terrestrial means. Allelochemicals secreted from ant feet further placate their aphid flock by acting as a narcotic and sedating the insect dairy into tranquil complacency, ensuring an easy roundup and herding of any stock infected with wanderlust. So, the next time you make a toast with your dairy-burgeoned holiday egg-nog, know that you are not alone in your festive enjoyment of the back-end bounty of a carefully tended flock. Somewhere, probably close at hand, are eight hymenoptera maids a-milking and savoring the rich delights of their labor as well. 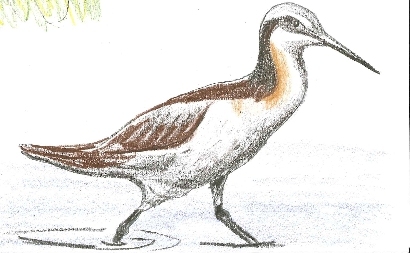 Offering a lesson to feminists the world over are nine Wilson’s phalarope (Phalaropus tricolor) ladies dancing. These largest of the phalaropes are a polyandrous crew, the “ladies” of the species coupling with several males, only to skip town when the parental duties arise. However, it’s not all promiscuous fun for the girls. As the breeding season approaches, the female phalaropes must abandon their saline winter refuges warmed by a South American sun, flocking ahead of their prospective mates to cooler freshwater marshes, shallow lakes, and wet meadows of northern Texas and other sites throughout North America, whose grassy borders will soon shelter the next generation of waders. Along the journey, their winter plumage will transcend to brilliance as burgundy-hued feathers ascend along their necks and flanks. Already physically larger than their masculine partners, female phalaropes in full breeding coloration more than surpass the duller males as they stalk along vegetated banks, searching for ideal nesting spots. Upon discovery of an idyllic natal crevice, their dancing begins. Neck-stretching and feather-puffing displays ruffle through the oestrogen-charged crowd as they defend their favored territories amidst the arrival of their tardy beaus. “Up”ing their “game,” lady phalaropes take to the skies in aerial pursuit of their mates of choice. Animated breeding displays ensue as indomitable females compete through dance-offs for the favored fathers of their future offspring. Both sexes accentuate the rhythm of the dance with nasal, soft barking vocalizations that punctuate the spirited bowing and posturing of the crimson-streaked females. Brazen lady waders claim their victory by copulating with their manly prizes, an act that will ultimately culminate in the laying of three to four eggs in a naked scrape hidden within a vegetated thicket adjacent to watered abodes. While the male Wilson’s phalaropes tenderly adorn the natal chamber with grasses and settle in for a future of incubation and precocial-child care, the dancing ladies set their sights on alkaline lakes garnishing the backbone of the Andes Mountains. The migrating absentee mothers swap their seductive gyrations for twirling aquatic ballets. Flanged toes propel the graceful hunters as they whirl in vortex-generating circles, sucking up small crustaceans and hapless insects from the bottom muck for easy surface consumption. Erratic mud-probing, bill-snapping wading ventures, and aerial lunges for flying prey intermingle with their pirouettes in the foraging maneuvers of these phalarope ladies as they dance for their suppers.